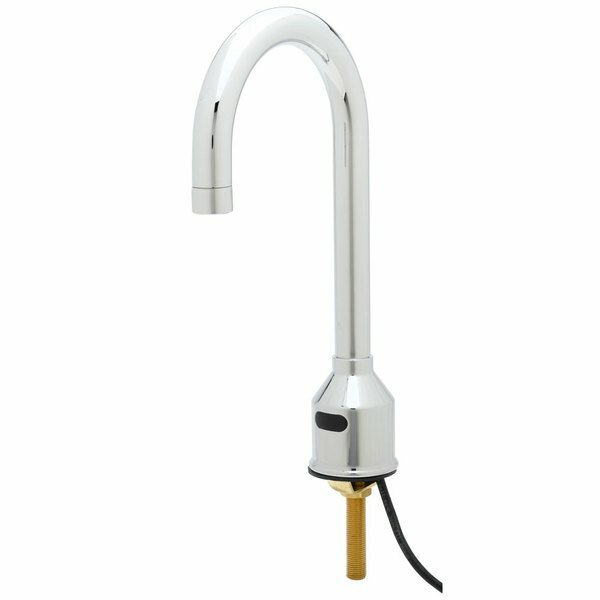 This ADA Compliant Equip by T&S 5EF-1D-DG-TMV electronic deck mounted faucet has a 11 1/2" high rigid gooseneck nozzle with a 5 5/8" spread that is ideal for hand washing sinks. Its electronic sensor will help you save water and also helps reduce cross-contamination because you don't have to touch anything to turn it on! It has a thermostatic temperature control mixing valve with integral check valves to prevent backflow. This T&S 5EF-1D-DG-TMV electronic faucet comes complete with a 3 5/8" x 4 3/16" x 2" deep waterproof control module box that is AC or DC operated with 4 AA batteries (sold separately).